Freda led the Ride on behalf of Kath who was unable to make it. 8 met at the Cross being Feda, Jim, Edwin, Richard, Phil, Gill, Avryl and newcomer Jonathon from Petworth. Tom and Eric joined the group at Chichester Station. Despite promises of heavy rain for all of the all day the weather was quite good with a lot of cloud in the morning, a very heavy shower for 20 minutes at lunchtime and warm sunshine in the afternoon. The unseasonal warmth of the last few days continued with temperatures up to 18C. A direct route was taken up Centurion Way and then lanes across to West Stoke Village Hall for the AGM. We met more members waiting at the Hall and more arrived from various directions for a total turnout of 22. The formal business was conducted quite quickly chaired by Phil. All the existing Officers and Committee were re-elected unopposed. The meeting discussed the new CTC proposals for local groups and decided in principal to agree these. There was a good discussion on organizing rides and the pace of rides and types of rides and events. The meeting closed at 12.20 and we turned to the important business of a sandwich lunch in the Hall. With the weather threatening nobody decided to go on to the Pub. As we were getting ready to leave at 1.20 the heavens opened with a torrential downpour for 20 minutes. We left as the weather cleared with everybody making their own way back in small groups. Sunday 23 October, Ride to the Bluebell, Cocking. For today's ride we met at Chichester Cross. I led the ride on behalf of Arthur who couldn't make it. 7 of us met at the Cross, myself, Phil, Sam, Harvey, Gill and Jeff and Beatrice on their Tandem. Adrian joined us at elevenses and Alan and Eric at lunch making a total of 10 out. Weather was fair with cloud and the sun occasionally getting through but with light winds and temperatures reaching 16C. 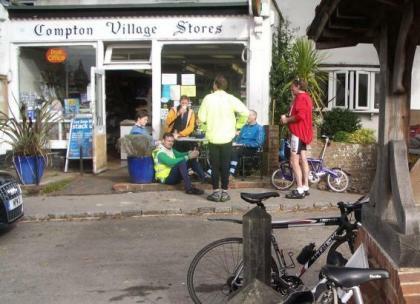 We rode out via Funtington to stop for elevenses at Compton Stores. We continued to the top of Harting Hill and then a fast swoop down to Harting Village. We then turned east to Elsted and the lanes at the base of the Downs via Didling to Cocking. The return was up the main road via Singleton and then lanes to Upwaltham and on via Eartham to stop for tea at Aldingbourne. Our arrival was well timed as they had insufficient customers for lunch to eat up their large Sunday roast so rather than throw it out they brought to our table 2 great bowls of roast potatoes and lamb gratis. We tucked in with relish but even hungry cyclists could not polish it all off. Eight members met at Chichester Cross on a bright Sunday morning – Colin, Chris, Jim, Freda, Yvonne, Bernie, Mary and Phil. 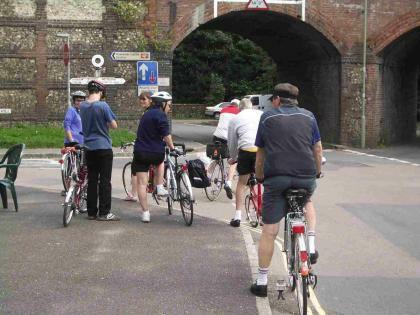 We headed west, crossing the railway, turning right before the A27 to cross back over the railway, and following the south coast cycleway route towards Emsworth and Havant where Adrian had arranged to meet us. We added another member, Jill, who caught up with the group before we reached Havant and met Adrian outside McDonalds. nearest pub, the Cormorant, had a sign outside saying ‘table reservations only’. The next pub along (the White Hart?) looked a better bet for lunch. The wind had not been noticeable as we cycled east, but was now strengthening from the east as we started back. We took the lower road for our return trip to Emsworth via back streets and over Bedhampton crossing (again closed for multiple trains). The usual cafe was closed for the weekend so we went down to the waterfront where a large crane was lifting boats into dry-dock for the winter. The cafe was full so we returned to Heidi’s where Phil and Mary had tea but the others decided to press on as the sky was now overcast and there was now a distinct threat of the promised rain in the air. A beautiful October day, following several recent days of overcast skies. Departed promptly at 10.00 am for the coffee stop at the Chichester Marina via Apuldram Lane and the cycle route from Dell Quay to the Marina. Whilst at the Marina conversation with a lone cyclist drew the leader's attention to the Salturns cycle route from Itchenor Village Hall to West Wittering and that it was possible to cycle from West Wittering car park to East Wittering along the seafront housing estates. The new route was used and proved a great success needing only a short ride on the main road to the shops. The route has been surfaced in some parts with hard-packed sand and in other parts it is grass – all well signposted. alternative to the main road between the villages. The route continued via Bracklesham Bay, Earnley, Ham, Sidlesham and Hunston finally arriving back in Chichester along the canal. Tea and cake enjoyed at the Canal Basin at about 3.0 pm, distance 26 miles. Despite the absence of quite a few members on overseas touring, the club's UK operations continue and in conjunction with WSCC a short easy paced ride was arranged for today, commencing from Bognor Library. The weather was better than might be hoped for in October, with brilliant sunshine, an almost cloudless sky, and temperatures hitting 20 degrees. Even so, only 3 set out for Aldingbourne - myself, Ann, and Julian. Our route took us to Felpham village, Middleton, and Yapton, where we followed the towpath of the old canal from Tack Lee Bridge to Ham Lane, before hitting the tarmac again to Barnham. From there, we diverted across the trackway (known locally as Pit Cut) to Eastergate Lane, then into Level Mare Lane before risking life and limb to cross an extremely busy A27 to reach the peace and quiet of the country centre. After exchanging holiday tales over several cups of tea, we returned to Bognor via Crockerhill, Aldingbourne Church, Hook Lane, Woodgate, Shripney Lane, and Bersted. All in all a pleasant afternoon's ride, distance covered being a modest 18.25 miles. 7 met at the Cross, the Leader Edwin together with Jeff and Beatrice, Mike Dunn, Richard, Vanessa and newcomer Gary Welham. Adrian later joined us at Cocking. Weather was sunny, temperatures about 17c with a blowy NW wind. The riders took a flat route up Centurion Way. We were delayed at the top end. The latch on a gate into a field had come loose and a lot of cattle had stayed onto the path. As we approached they bolted up towards the road and then along the cyclepath adjoining the road causing a little traffic chaos.We continued on our way to Cocking meeting up with Ernie and Nicola at the Moonlight Cafe. Our route then took lanes via Heyshott and on to Tiffins for lunch a little late at 1.15. We met the Walberton Pond group and Richard returned with them via Cocking and Adrian made his own way back direct to Portsmouth. Vanessa and Gary also decided to make their own way back as Vanessa was struggling with the hills. Edwin, Mike, Jeff and Beatrice returned on lanes to Bury stopping for Tea at the Barn by the Willow Cafe meeting up with Dave Fox, Dave Galle, John Wickens and Richard Boulton from Arun Adur. Sunday 2 October, Tiffins Petworth, Walberton Pond start. 3 met at the Pond, the Leader Colin together with Gillian and Chris.Weather was sunny, temperatures about 17c with a blowy NW wind. The riders stopped for elevenses at the Barn by the Willow Cafe before heading on up to Petworth. After sandwiches the riders met the Chichester Cross group at Tiffens. The groups split up again with each taking a route back which the other came out on. Richard joined the group for a quicker way back to Chichester. 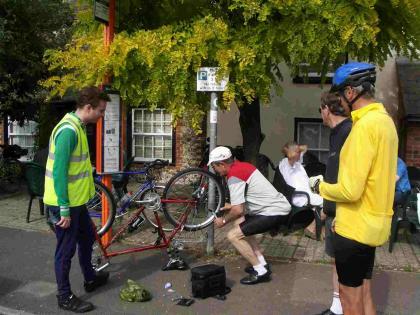 Today was the last of the 2005 DA Events being a 27 mile Reliability Ride starting and finishing from Wiggonholt. The idea was to judge pace and complete the ride within 15 minutes either side of a time from fast to very slow chosen by the rider in advance. We all made our own way to Wiggonholt for elevenses before the start of the Ride. We had a good turnout from our Section with 7 taking part being myself, Colin, Nicola, Phil and Mary and Jeff and Beatrice on their Tandems. Heavy rain earlier had cleared by the time I left home at 8.40 and skies brightened during the day feeling warm at times for late September. We set off on the ride which took us out over Greatham Bridge, through Coldwaltham to the crossroads just before Burton Mill where it turned north to Byworth and then on to Kirdford. The return leg was back through Wisborough Green to Newpound Common, over New Bridge(A272), down to Adversane and across the A29 and then it was south from Broadford Bridge to West Chiltington and Nutbourne Common before returning up the A283 to the RSPB Centre again. The final results of the years DA Events can be seen at the DA Website under “Events” Our Section managed 3rd place (out of 3) Congratulations to Colin who was placed 2nd in the individual event. Sunday the 18th September 2005, three Cafes ride. 12 riders met at The cafe in Bosham and we were joined by three more riders. At 11:05 we proceeded to Rowlands castle via Woodmancote and Westbourne. On arrival we were joined by more riders who altogether made a total of 18, the weather was fine and sunny and the food and the Rowlands castle cafe was excellent as usual. Our departure was delayed by a particulary difficult puncture and because of this we had to take a fairly direct route to the afternoon tea stop at the Roman palace at Fishbourne where tea and cakes were consumed in some quantity after that everybody dispersed at about 4pm. Thanks to everybody who turned up and made it such a pleasent ride. Arthur Smith. Sunday 18 September. 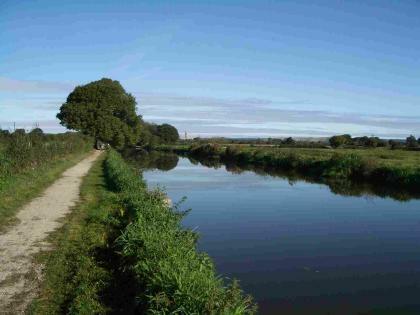 Riding to the start on Chichester Canal Towpath.Pictures below by Edwin. Ride report by Lynn to follow.